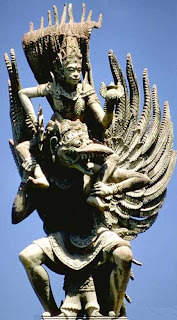 The statue is the world's tallest statue of Garuda Wisnu Kencana in Bali Island of Indonesia with a height of 145 m)Location of Sculpture at the Garuda Wisnu Kencana Cultural Park on the island of Bali, Indonesia. Today, tourists can enjoy this GWK Cultural Park. Statue of Lord Vishnu who erect half-body (without hands), and the head of the Garuda bird has become a spectacle of thousands of tourists each month. GWK area itself is a rocky limestone hill with an area of about 200 hectares. Previously, the area named the Bukit Ungasan is barren hill that is not much known for not having any tourist charm. However, after the monument was built, this area started growing and increasingly taken into account.